Well it is a NEW one for me? with a twist for January. and, here is the card I created for the challenge.. I dipped a piece of watercolour paper in and let it dry naturally - before inking the edge, twisting a piece of twine around the bottom - stamped a bee and adhered the zipper pull for a body, sponged through the spotty stencil - inked a sentiment in black and it's ready to go!! Very cool, Alison. That bee is super! And your background is beautiful. 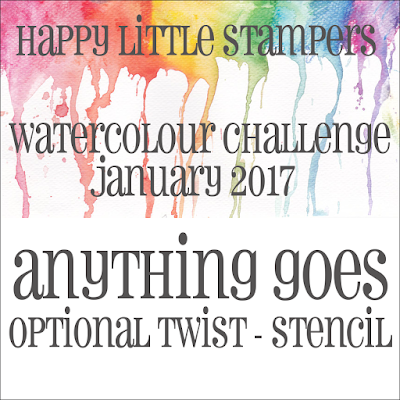 Thanks for playing along at HLS WC challenge for January.